I’m sat at a camp site on the banks of the Chickahominy River, 7 miles west of Jamestown VA, on what has been a great first day on the Trans Am. Leaving the sanctuary of the Holiday Inn and riding my bike out onto some busy fast roads was a baptism of fire, but so far I’ve been rather impressed with the attitude of American drivers towards cyclists, the Brits could learn a few lessons! This formed the start of an historical trail down into Yorktown. 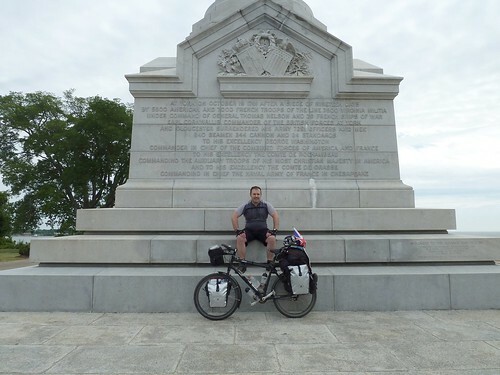 My knowledge of American history is dire and I pulled up next to the French cemetery and further along the French gun batteries and asked myself the ignorant question…. What were the French doing here? I’ll have a Wikipedia session when time allows and find out. There is also the small matter of the rear wheel dip in the Atlantic, for which I called upon the photographic expertise of the Dutch Transamers once again. After taking the photo I slyly tried to glean more info about the French and their big guns, to fill my knowledge deficit, without appearing to be thick. It was greeted with a shrug as they had also visited the French cemetery and gun batteries and asked the same question. May be the Dutch National Curriculum is the same as the UK’s, or the three of us happened to be taking a sicky off school on the day they did the “French Blast Big Guns In America circa 17c” lesson! Answers on a postcard please!! Formalities over and done with I did a few laps of Yorktown soaking up it’s amazing historic buildings and then took to the Colonial Park Way, a lorry free route that hugs the coastline of the York river before heading inland to Williamsburg and Jamestown. The road was nice and wide, tree lined and punctuated with tidal inlets and wading birds. 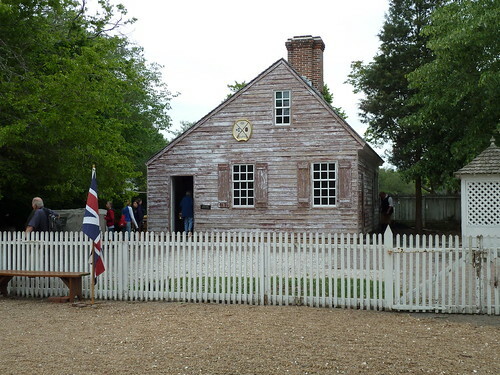 Thinking I had probably seen enough olde worlde American houses in Yorktown, I almost bypassed Williamsburg, glad I didn’t! The place is a town stopped in time, early 1600’s I think (damn day off school showing me up again)! Everyone is dressed in authentic period costumes and the many buildings that form the town have all been restored to there original glory. This could have quite easily been tourist tat but it was truly a living museum and time machine. Leaving Williamsberg an oldish American couple stopped me and asked how far I had rode, I told them and then explained my plans and they were just overjoyed, it was a real z list celebrity moment and we chatted for some time. Really made my day and as I headed down into the edge of Jamestown I was grinning all over my face. I didn’t explore Jamestown as I really had od’d on history but instead headed towards the Capital Trail, a partially complete designated cycle route through some lovely countryside. This route took me to the camp site I’m at tonight. Thinking my day was probably all done I had a last surprise when two cyclist arrived on the camp site and introduced themselves as Jack and Sue, the advance guard and organisers of a cycle touring group who were on a weeks “learn how to cycle tour” course. They invited me over for dinner and I popped by for a hotdog and beans and had a good chat with the group. They were a lovely bunch and it really made my evening. They were really interested in my trip and Jim the group leader is a Trans Am vet and gave me a few good accommodation and general touring tips. My Rohloff hub also grabbed the attention of a few of the group who had never seen one. I couldn’t have asked for a better start to my trip, I’ve already seen the legendary generosity of the American people and the scenery has been stunning. Lets see what tomorrow brings. An the french were the colonies allies in defeating the brtitish, integral to the birth of the usa. Wow what a day. I'm exhausted just reading about it! Sounds like you've made a great start Stu. Already looking forward to reading the next instalment. Have fun. Great first day by the sounds of it. The first of many I'm sure! 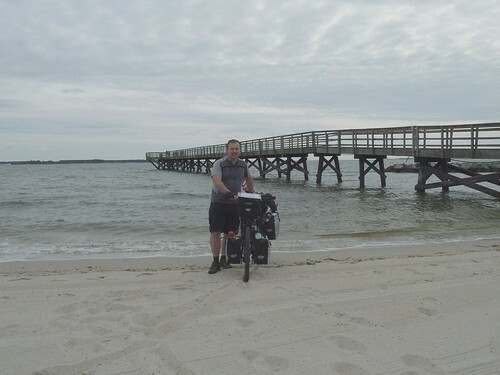 (I rode in on the Colonial Parkway at the end of my Trans-Am 3 years ago)! Great to see you've started your journey. Good luck! you are so lucky and am happy for you, stu.